CRASA is supporting about 100 women (mostly in their old ages) who are suffering in coastal villages. These women belong to poorer section of the society often abandoned by their own families. They live by doing some menial works. They are unable to support themselves fully event with work and often suffer from medical problems, which became worse after being untreated for long time. CRASA is supporting them through free medical and eye camps for them and provide medicine and nutritional support. CRASA provides food items 15kilo rice, 1kilo cooking oil, 1 kilo provisions, 1 saree, 1 blanket and medicines to these identified women to live a decent life . Compassionate Rural Association for Social Action (CRASA) is a grassroots level Non-Profit Organization working for the development of poor and needy people in coastal villages of Andhra Pradesh, India since 1998. It is initiated by a team of self-motivated volunteers to address issues of the society with a holistic people centered approach and sustainable development of the marginalized and deprived people. CRASA has been rendering it services to children, women, differently abled, youth, and aged through multiple programs in education, literacy, livelihoods, relief, rehabilitation and development. CRASA has been helping orphans, poor children and HIV affected children’s education by providing education materials and school supplies, groceries to the aged, livelihoods to the disabled and single women, skill building trainings to the educated unemployed youth and women, and conducting awareness camps on health, environment and bio diversity. CRASA is registered under the societies act xxi of 1980 vide registration no 168 of 1998, it is also registered under 12A and 80G of income tax act and FCRA act. Jainu Laxman is a orphan child, studying 8th class, his father is died 10 years back with health hazard, from that day onwards his mother Venu is taking care of him and his sister Bindu by doing agriculture wage labor, even her health is not good, her ambition is to give good education to her children. His mother is very poor and unable to fulfill the educational needs, dress and food expenses of Laxman and her sister. Laxman feels very bad and un comfort to go to school sometimes he goes to the school by walk and his friends bicycle. One of the time he become a regular absentee to the school our volunteers noticed and bring to our notice. CRASA provided books, uniform and school bag, now he is regular to school and 1st rank in studies and he want become a Teacher. Chodabathina Narsamma, aged 82, resident of Kothapalem lives alone in a small hut in the village. She is a mother of two daughters; both are married. She cleans utensils and washes clothes in nearby houses and gets leftover food to eat. Apart from that, she gets Rs.200/- as pension. At this age, she has health problems, but has nobody to look after her.CRASA has identified 100 such women that are suffering in coastal villages. CRASA has conducted free medical and eye camps for them and provided medicine and nutritional support to them. 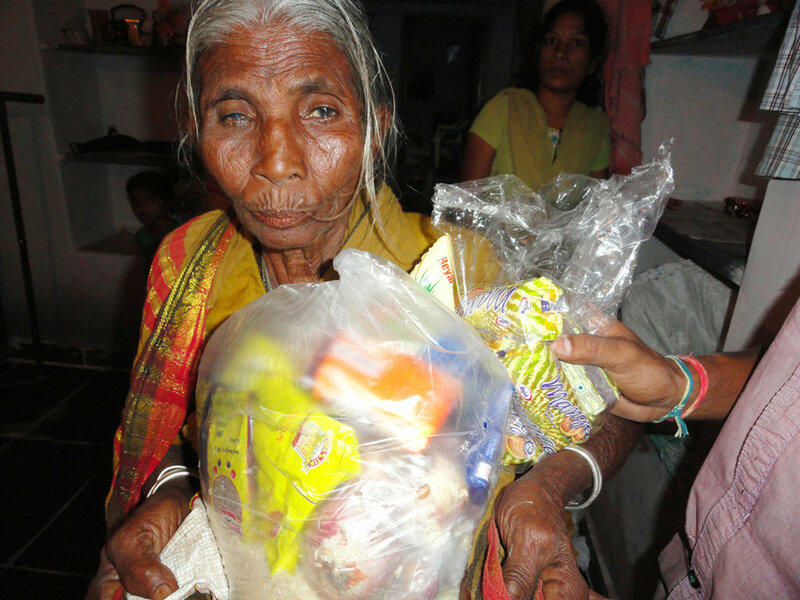 CRASA provided food items 15kilo rice, 1kilo cooking oil, 1 kilo provisions, 1 saree, 1 blanket and medicines to Chodabathina Narasamma from CRASAs local funds.With CRASAs support, now Chodabathina Narsamma is able to get food twice a day, and has medicines and clothes. She is happy and living a peaceful existence.